Suggested by iKnowledge It’s time for Wonder Woman to enter the fray in a gauntlet of 2 back to back fights against Berserk characters. She would certainly be able to overpower Guts in his normal form, but his armor may make him a little too quick. She can likely still keep up with him as far as power is concerned, but speed is where he has the edge. She will have a hard time countering his blows and as his power is high enough to harm her, I don’t think Wonder Woman will be able to come out on top here. His attack range is too great and backed up by his speed that is lethal here. Guts wins. 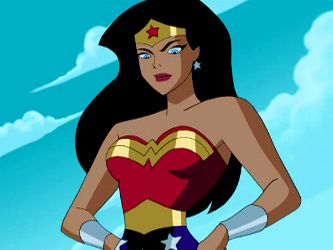 This entry was posted in Battles, Guts Battles, Wonder Woman Battles and tagged Guts, Wonder Woman by dreager1. Bookmark the permalink. Guts: You’re good, but not good enough. I should tell Casca about you. Wonder Woman: This Casca must be someone you know and respect for her fighting skill.